WINNIPEG - It is no easy feat to overtake a record July set in 2014. Nonetheless, July 2015 sales were still brisk. At nearly 1,400 sales, they are 6% higher than the 10-year sales average and third highest for this month ever. If not for condominium sales lagging behind in July as well as this year-to-date, July 2015 would have narrowed the gap in MLS® sales from last July and been even more impressive. 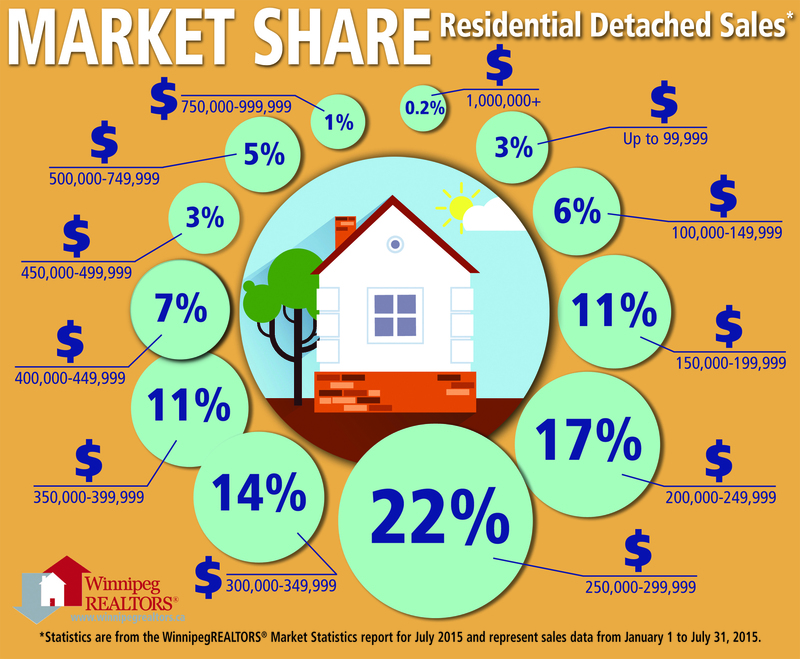 Residential-detached sales continue to perform well in comparison to 2014. They are only down 2% from last July and are up 3% year-to-date. On the other hand, condominium sales are off 22% in July and 17% for the year. July’s MLS® dollar volume at $384 million is just 1% down from July 2014 despite sales being 6% higher that year. Year-to-date dollar volume is 1% ahead of 2014 at $2.17 billion. Year-to-date MLS® sales of 7,896 are down less than 1% from 2014. While affordability remains a hallmark of Winnipeg’s real estate market, July results show first-time buyers were not as active compared to last year. In examining the three key affordable house price ranges from $150,000 to $299,999, there were 80 fewer residential-detached sales. This number represents a 13% decrease from July 2014. Condominium sales showed a similar downward result for the two price ranges from $150,000 to $249,999 with 23 fewer sales from 2014. However the next higher price range from $250,000 to $299,999 showed an increase of six sales over last year. But we must remember that MLS® sales in 2014 set records, so this year’s numbers are still healthy. The most active price range in July for residential-detached was $250,000 - $299,999 (22% of sales), followed by the $300,000-$349,999 (16%) and $200,000-$249,999 (16%). Another 22% of sales were split evenly in the $150,000 - $199,999 and the $350,000-$399,999. Average days on market for residential-detached sales was 33 days, 5 days slower than July 2014. The highest priced residential-detached sale was $1,431,000 and the least expensive sale was $30,000. The busiest condo price range in July was $150,000 - $199,999 (29% of sales), followed by the $200,000 -$249,999 (22%) and the $250,000 - $299,999 (18%). Days on market for condo sales was 41 days compared to 34 days last year with the highest priced condo selling for $880,000 and the lowest priced sale at $87,500. Established in 1903, WinnipegREALTORS® is a professional association representing over 1,880 real estate brokers, salespeople, appraisers, and financial members active in the Greater Winnipeg Area real estate market. Its REALTOR® members adhere to a strict code of ethics and share a state-of-the-art Multiple Listing Service® (MLS®) designed exclusively for REALTORS®. WinnipegREALTORS® serves its members by promoting the benefits of an organized real estate profession. REALTOR®, MLS® and Multiple Listing Service® are trademarks owned and controlled by The Canadian Real Estate Association and are used under licence.